What do you do with your leftover scraps when you're done with a project? For the last year or so I've been trying to cut my scraps into squares so they will be ready for a scrap project whenever the need arises. I know Lori Holt did a big blog post on this idea back in 2013 (which you can find HERE). 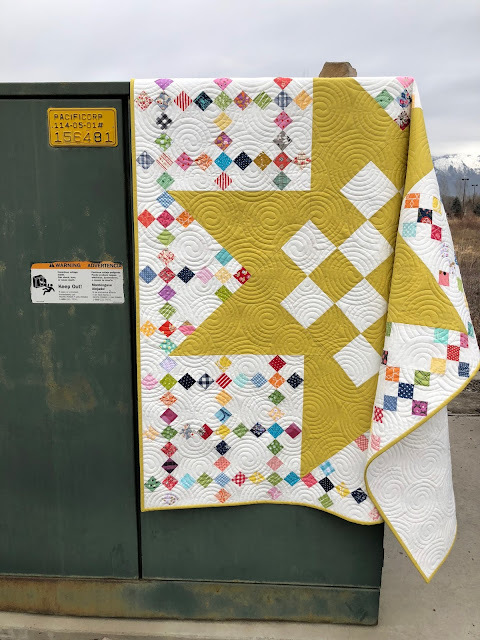 I've been really inspired since then by some of the amazing scrap quilts some of my friends have made using their pre-cut squares. So, after a few crazy months at the end of 2017 when I designed 3 new patterns - Snow Village, With Love and Wonder (I'll share Wonder with you soon, it was an exclusive pattern for the Quilters Candy Box I curated in January) I decided I wanted to do some selfish sewing. I started making 9-Patches with some of my pre-cut squares. I didn't really know what I was going to do with them but the idea somehow quickly came to me to use them as the background for a giant star. Originally I was planning on doing a vintagy, medium/dark green solid fabric for the star but the fabric store I was at didn't have a huge selection so I settled upon these 3 solids (above). Obviously I'm not the most patient person to hold out for the perfect color I had in my mind! I just wanted to get it figured out! The mustard yellow spoke to me for some reason so I went with that. Note: It's interesting to me why we choose certain colors. I went through the whole rainbow practically, in my mind. I knew I wanted something bright that could stand up to all the bright fabrics in my 9-Patches. But I find that red can be overpowering in large doses. 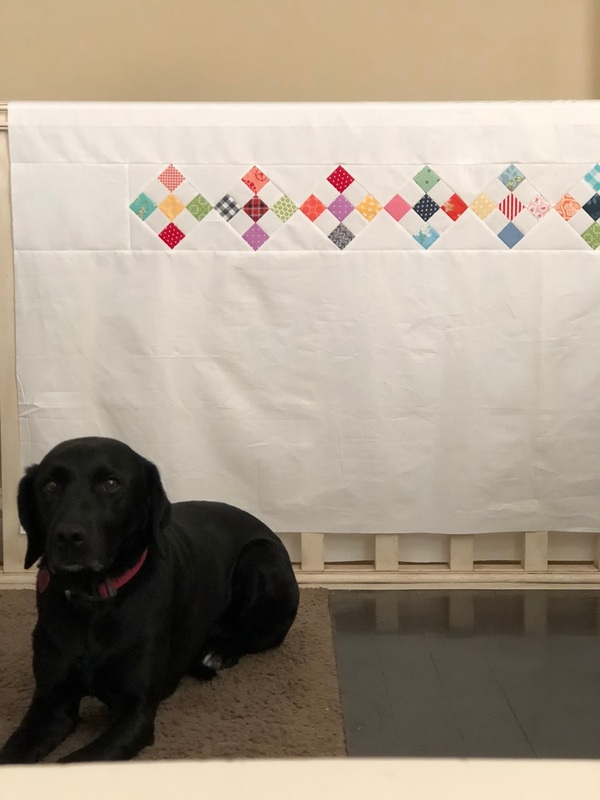 Orange - I just wasn't feeling that for this quilt. Yellow - I thought yellow would look washed out. Green - green sounded good. Blue - I love blue but thought it was a little too safe. Fushia, Pink, Purple all seemed a bit too much for me and my house (and for this project). So I finally settled on this mustard yellow. Because it has black pigment in it and is not a "true" yellow I feel like it can stand up to the bright fabrics without getting washed out. I don't use yellow very often but was excited about it and ended up feeling like it "made sense" since it was for a star. 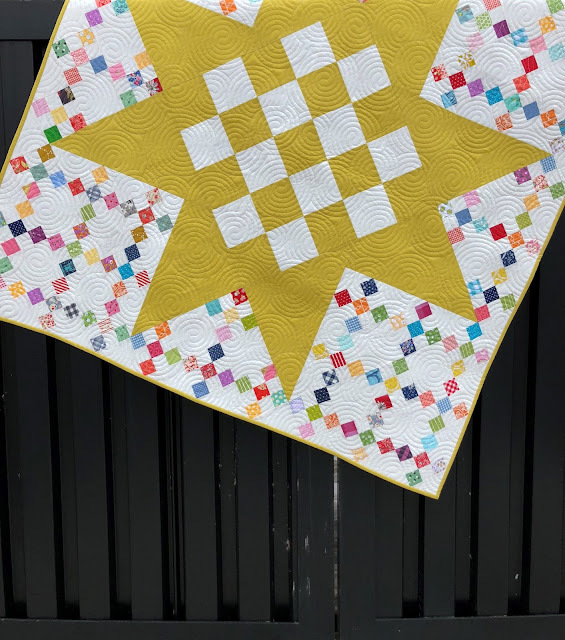 But really, as I was making this quilt I thought - a lot of colors would look fabulous for the star. It's all personal preference and I hope to see many different color versions of this pattern someday! I wanted to use up some extra 9-Patches on the back and am completely in love with that little surprise on the simple, white back. I've had a request to write up some instructions on how I did the back. Would any of you guys be interested in the instructions for that? I had my quilter (Cathy Barney from Alpine, UT.) do a new-to-me swirl design for the quilting. It's called "Overlapping Crop Circles" by Digi-Tech Designs. 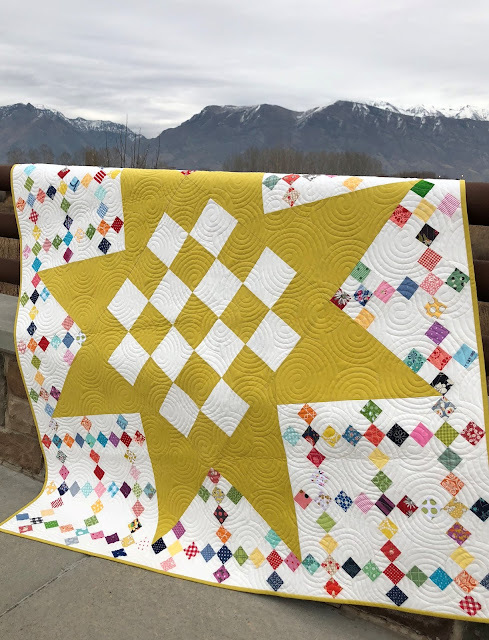 I really like how it turned out and how it keeps the focus on the quilt pattern. After a quick photo shoot outside, it was time to bind! 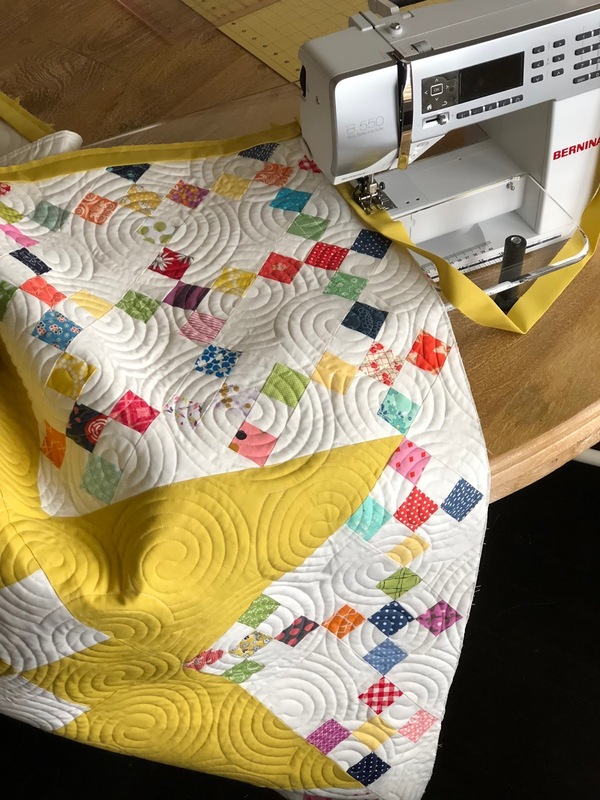 I can't bind a quilt anymore without using my Binding Baby! It's so handy! See my thoughts on it (along with a few of my other favorite notions) HERE. So, what was supposed to be a "selfish sewing" project, turned into a new pattern! Star Patch is the name I chose after opening up that discussion on Instagram. If you're interested in purchasing this pattern click HERE to visit my Etsy shop. 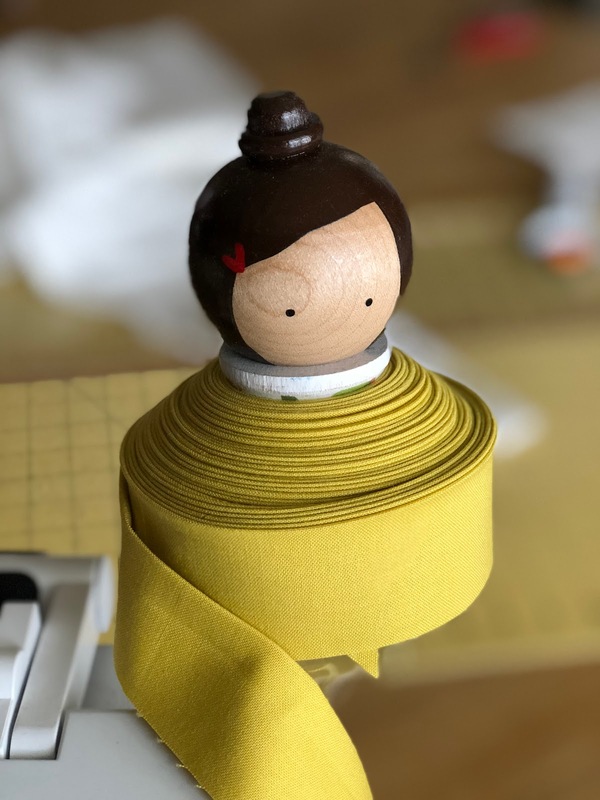 There are PDF and paper patterns now available!